August is peak time for viewing colorful, little hummers. This popular feeder at Wyalusing State Park is drained about every three hours. An adult male Ruby-throated Hummingbird hovers near the office building Thursday. No matter how often one sees them, hummingbirds are fascinating, and right now is the peak time for observing hummingbirds in Southwestern Wisconsin." "There is not a person who does not comment on those birds," said Bev Pozega, who estimates that there are about 50 hummers at the office at Wyalusing State Park. "People love to look at them and take pictures." Pozega, who works at Wyalusing State Park, has had an enthusiasm for hummingbirds since she can remember and has put out feeders at the Wyalusing office for at least 15 years. "They go through two or three gallons of food a day," she said, noting that one popular feeder hanging from the corner of the building is drained every three hours. Pozega uses four cups of water for every one cup of sugar to make the feeding solution. She then boils it and refrigerates it. Pozega said that the hummers go back and forth between a nice group of roadside flowers near the office building and the feeders. They also perch in nearby small trees at times. "It’s just unbelievable how many there are," said Pozega, who noted that the best times to see Ruby-throated Hummingbirds is in the early morning and in the evening. Rainy and cloudy days are the best, she said. "It’s just crazy what a little bird can do to a person," said Pozega, "whether its a small child or a big, burly biker." Pozega said that the hummingbirds put a smile on everyone’s face and park visitors don’t mind waiting in line for stickers and such. "Often, we’ll be talking to them and then we realize that they’re not even listening, they’re so engaged with the birds," she said. "Some people have never seen a hummingbird in their life." "I do it [put out feeders] for myself and for the people," said Pozega. "It’s just my little part of showing people what they’re all about." A tip for homeowners, Pozega said, is to put out several feeders and have them close together. That is a key to attracting more hummingbirds. The hummers show up around May 1 and stay until mid-September. She said that a person should keep the feeders out until they haven’t seen a hummingbird for at least two weeks. Pozega said that hummingbirds are not seen as often from late June through early July because they are in the process of having and caring for their young. Ruby-throated Hummingbirds lay jellybean-sized eggs and raise two young at a time. Pozega said that the adults feed spiders and insects to the young. 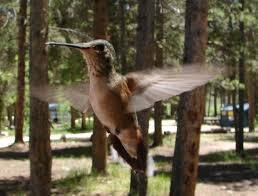 Hummingbirds are known to migrate great distances and are annual visitors to Wisconsin. There are four species of hummingbirds that have been sighted and documented in the state. The Ruby-throated Hummingbird is the most commonly sighted species in Southwestern Wisconsin. The Rufous Hummingbird is also commonly seen in the state. Anna’s Hummingbird and the Green Violet-ear Hummingbird are considered "accidental" visitors, according to Hummingbirds in Wisconsin by Deborah Anderson. Accidental species means that they have been documented less than three times and are out of what is considered their normal range. 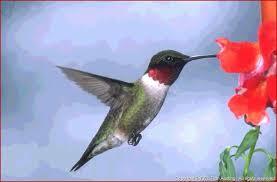 The hummingbirds at Wyalusing are adult male, adult female and juvenile Ruby-throated Hummingbirds. The bright, iridescent colors, along with the zooming, zipping, darting, stopping, hovering and backing up make for quite an interesting aerial display.